Now we are cooking. After three days exploring one of the largest concrete cities in the world (Tokyo), we allowed the Bullet Train to carry us like a snake on a two and a half hour mission into the hilly, quaint, canal-filled spiritual city of Kyoto. We sped through packed cities which looked there was no place to breathe, power lines of all types holding them as if string on a box, lots of Toyota references, baseball sandlots, through many dark tunnels, into countrysides of rice patties and produce being harvested, stopping only 3 times (takes a while to slow down a bullet), and noticeably without the noise of clanging bells and warning lights at railroad crossings since at no time does a road cross the railroad (too dangerous at speeds up to 200 m.p.h. ), We passed but due to haze could not get sight of Mt. Fujiyama, at least not this time. 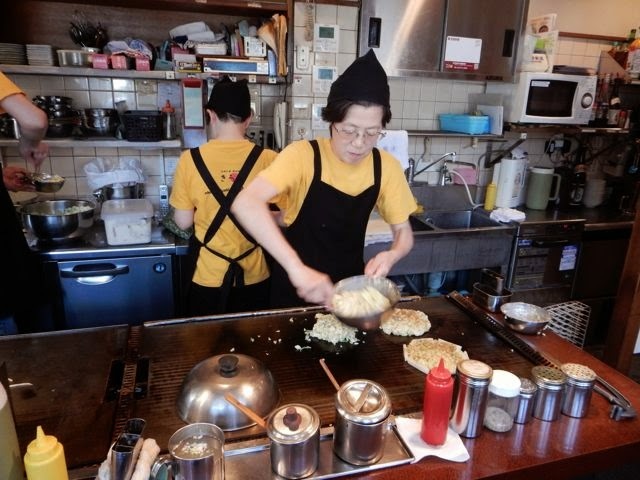 Duff, the owner of Wabi-Sabi, the agency which prepared this extraordinary trip for us, was waiting in Kyoto at the train door for us and immediately led us to a small, family restaurant where I think I found my favorite food - Okonomiyaki - which is sort of a pancake omelette grilled on a flat small table at your seat, Benihana-style. 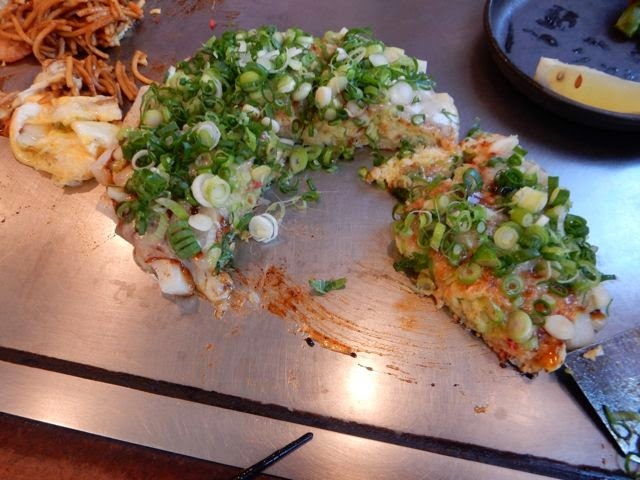 The omelette can be wrapped around fried soba noodles and cabbage, pork, shrimp (called Yakisoba), or it is flat like a thick pancake (I dare not say pizza because this is still an egg delight) and covered with green onions, more eggs, cheese, squid, pork, shaved carrots. The secret of the whole thing is a sweet, spicy sauce more like Worchestershire sauce than anything else. Mayonnaise can be dribbled over that. It’s your call. OMG! It is huge on my like list. Reenforced we set out to discover new things older than time: spiritual havens which come in large and tiny sizes throughout this city. 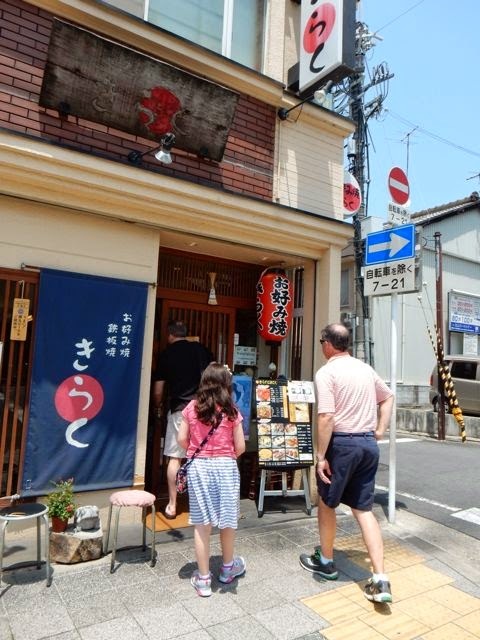 Tiny shrines sneak up as you walk through narrow lanes and the big ones, at this time of year, are packed with students in sailor uniforms (style) on their summer break field trips. Interestingly, as we walked through the historical treasures dusted and garnered by Buddhist, Shinto and Zen monks, I only saw one monk dressed in white at the final one, which is quite different from other Asian experiences. The Japanese are amazing, hard working, respectful, learned, welcoming people. Tokyo was completely destroyed in World War II, yet in 60 years it has risen to one of the most modern, exciting cities without giving excuses or wining about how they have been treated. Politeness reigns. So does reaching goals and visions. 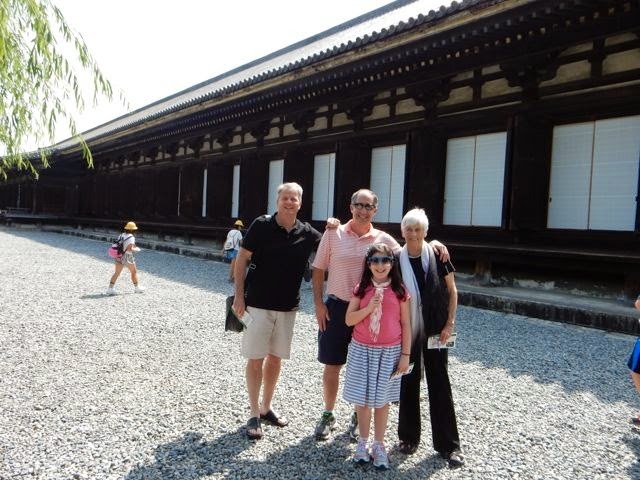 Kyoto, oddly, was not damaged during the war, so it retains the charm and openness it always had through history. The Japanese spirit and culture is out there for all of us to enjoy. What a blessing. because each saves 25 worlds (I hope ours is included, it could use some help.) It is said Kannon, god of compassion, can transformed himself into 33 different figures, which would mean 33,003 Kannons, a mighty force to engage. In the many hand palms branching from the side of the breast are tools to be used like axes, bows, nails,lotus flowers, religious relics and incense bottles. I was overwhelmed by the 1000 standing figures carved from wood in the “Yosegi-zukuri” manner, and covered in gold leaf. Each one almost duplicate of the other, and yet each face had something different about it from the other - the mouth, the hair, something somewhere so subtle you had to look long and hard to see the difference. 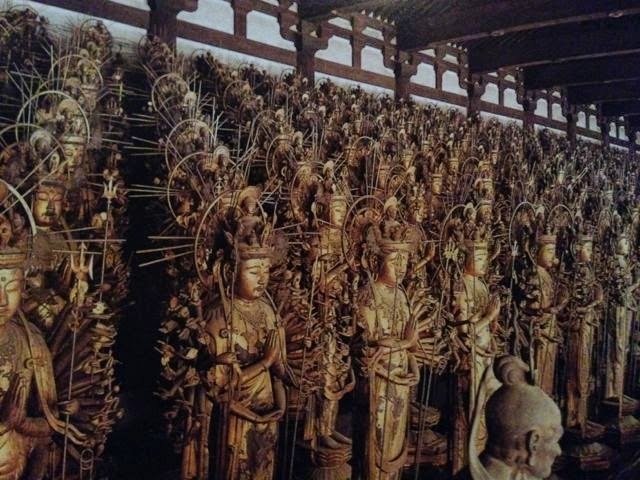 There’s more: between the rows of golden Kannons and the fence protecting from public touching and feeling or photographing this menagerie of religious art (each about 62- 65 inches high) are 28 guardians of the deities, protectors in horrifying and threatening poses and faces. Here are combination of Hindu and Buddhist characters such as Jimmo-ten, (Kishimojin) once a female demon who ate children but got enlightened and now protects children and child birth and Birubabuska who is a guard with a thousand eyes, one being on his forehead - eyes are big in this faith. Every statue has an eye in the palm of its hand. prayer, as if that was her main job. 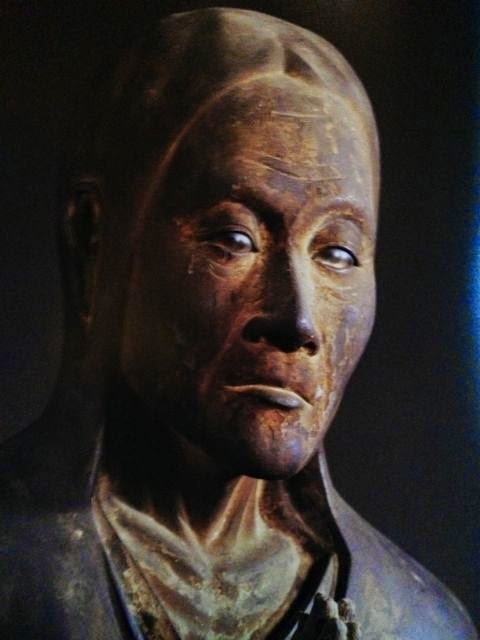 She is called Mawara-nyo, meaning mighty female General, but no details are known about her. Aha. The mysterious woman of faith. She uses peace and prayer whereas the other 71 are like overachieving monsters putting all the physicality they have out there to protect the Buddha. What is eerie about Mawara-nyo, the empowered woman no one knows much about, is her eyes. Through thin slits they look so real it makes you stop and look again. I know she was looking at me, (I could feel it in my gut), and I’m sure she sees all of us women who fight for our faith. Whew. This was a tremendous opening for me. Nearby one could by a candle for a dollar and give it light for your needs. I lit one for our WANA cancer group. 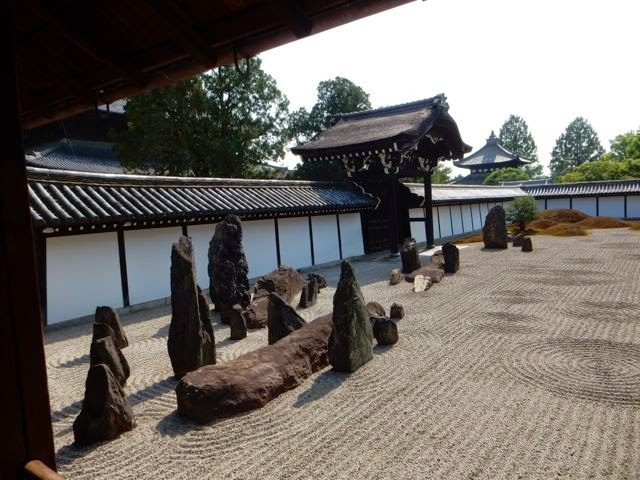 Next we stopped by a Zen temple/garden - Tofuku-ji - where peace and horticulture and sand and stone alignments give visitors a place to slow down and meditate. At cherry blossom time in the spring and the colorings of the trees in the fall, the place is packed. 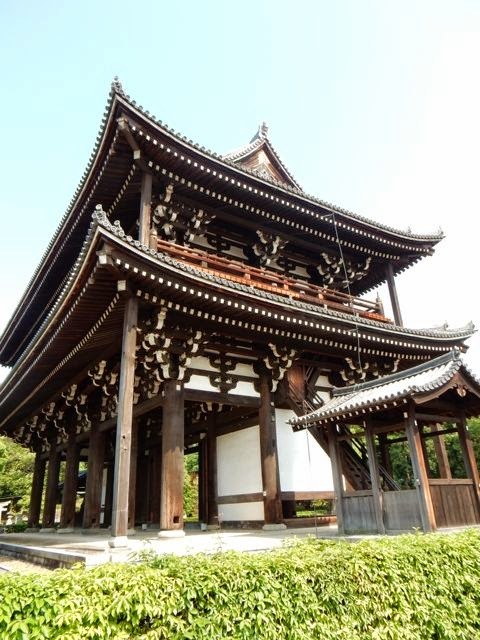 This temple was started by a priest, Enniben 750 years ago, who became the first priest to be called KoKushi (chief priest) by the Japanese Emperor. The garden wanders between double roofed structures spread out across the park - mostly dark brown wood with tile roofs, typical temple stances, roomy with decks that allows one to gaze and ponder the beautifully combed images in the white sand spiritually arranged around boulders of all sizes for contemplative highs. A slow down. Much needed. 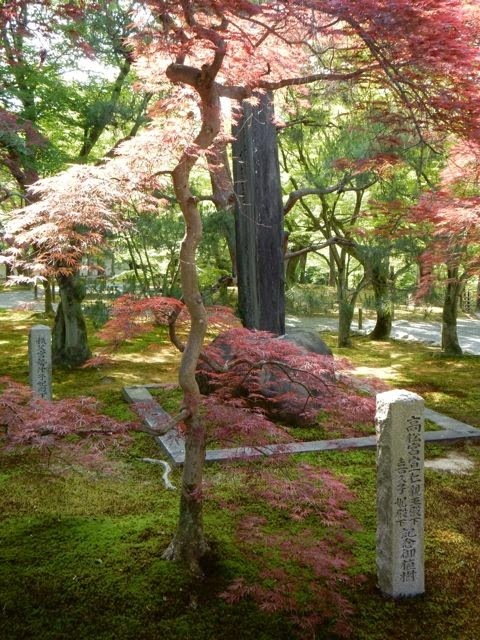 However, as one enters, stepping on the thick panels of Japanese Cypress wood, you hear a peep, cheep noise, strange as it is, which has a purpose - an alarm to the monks that someone is coming in. It’s call the nightingale effect. Finally, softened in energy by now, we got to the famous orange Torii Gates. Another WOW moment for me. 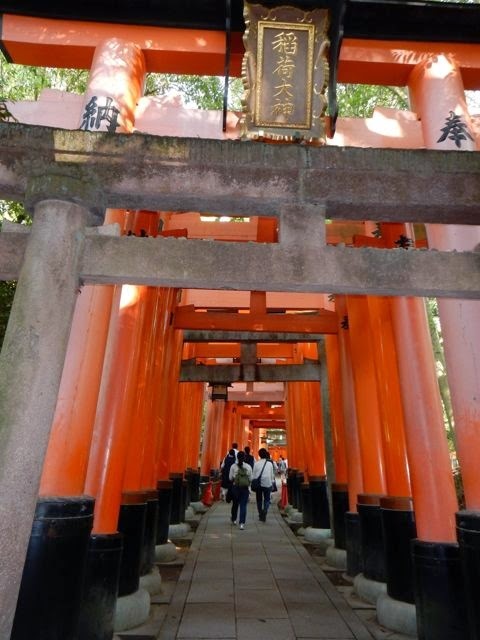 These bright orange thick columns with an arch holding them together that grace so many tourist minds about Japan, are much more than that. 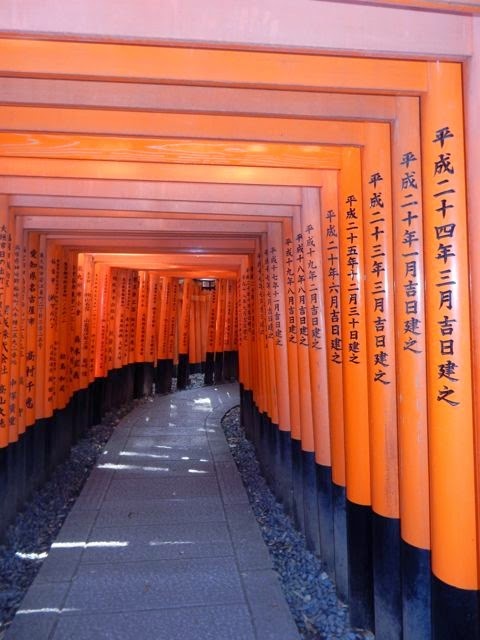 Fushimi Inari-taisha Shrine, a Shinto shrine , is dedicated to the god of rice and sake (wolf) and was built in the 8th century. In a Shinto shrine relics of the sacred Kami are stored so people patron these shrine to pray for good fortune, even though no one can see the relics. 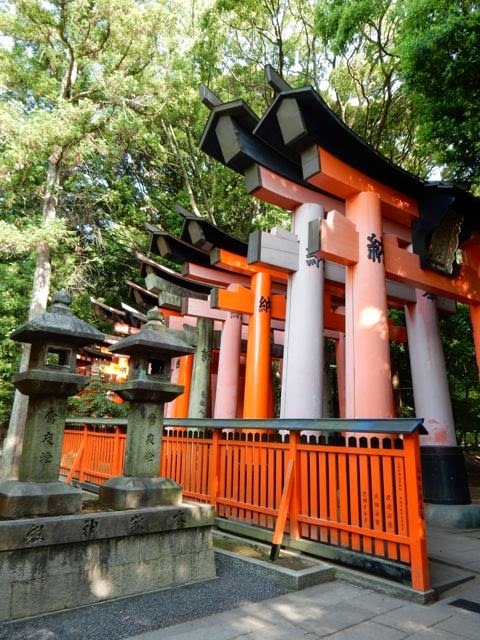 At Fushimi are over 5000 vibrant orange Torii gates winding through the hills of this shrine. Late in the afternoon is the best time to visit (along with everyone else) and the more you walk through the wooden columnar gates (like trees themselves), packed one after another and all donated for the purpose of offerings, you get energized. There are many statues of wolves as well but the fun, the spiritual pursuit, is to walk through as many gates as possible - and at one point as the grow shorter in size, the path splits and there is a choice if you want to go left or right. I went left, thinking it the road less traveled. The non-tired can make the entire trail to the top. I hope I can get back and do that before I leave Kyoto. It was late and hot yesterday afternoon.